SFP+ cables from ipolex were developed specifically as a cost-effective and lower-power alternative to optical modules for short reach links in high-speed interconnect applications such as high-performance computing (HPC), enterprise networking including top-of-rack switching and network storage markets. The assemblies support data transfer rates up to 10+Gb/s per lane, meeting or exceeding current standards specifications. - Compatible with any devices using SFF-8431 open source EEPROM, and two ports of cable can connect different devices. Such as one port connect Cisco's switch and one for Ubiquiti. - If you can't confirm your device's brand compatible, please feel free to contact us. 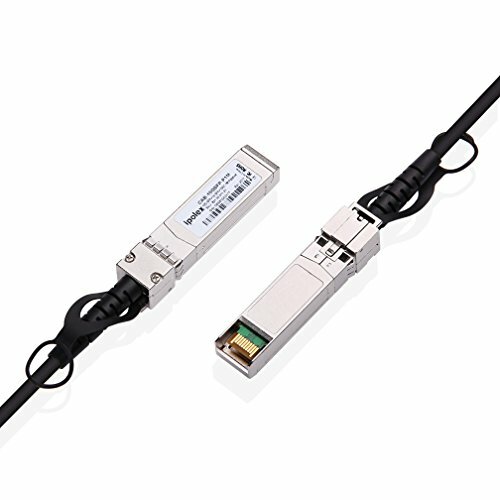 Multi Compatible - This SFP+ cable compatible with any devices using SFF-8431 open source EEPROM, and two ports of cable can connect different devices. Such as one port connect Cisco's switch and one for Ubiquiti. Just need confirm your switches is no requirement to coding. Cost-Effective - Low power consumption SFP+ twinaxial cable provides a cost-effective fiber alternative to installing fiber transceivers and cables to connect a 10G network. Plug and Play - It is hot-swappable and Multi-Source Agreement (MSA) compliant. Easy to install. Wide Application - connects a switch, server, NIC, or transceiver for Network Attached Storage (NAS), Storage Area Network (SAN), and High Performance Computing (HPC) applications such as Fibre Channel, InfiniBand, and SONET.